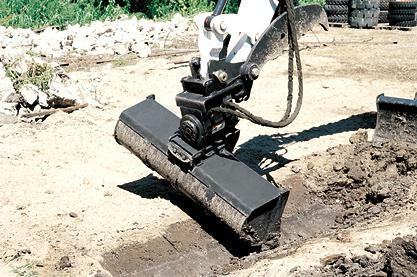 Dig under and around objects with the flexibility of the Power-Tilt® attachment. Designed for compact excavators, the Power-Tilt attachment delivers maximum productivity on the jobsite when powered with a bucket. Using a wrist-like action, the Power-Tilt attachment tilts the excavator bucket to the left or right – instead of moving the entire machine – for a range of motion that allows it to dig around and under objects such as culverts and sewer lines. It even delivers the flexibility needed to dig and shape holes or ditches. Combine the Power-Tilt attachment with a grading blade or grading bucket attachment for increased grading power. The grading blade and grading bucket are ideal for backfilling trenches, leveling terrain, and finish grading. X-Change™ Attachment Mounting System: Makes easy work of attaching and detaching the power tilt swing. Fast and easy mounting means spending less time on attachment changes and more time on the job. Up to 180 degrees of rotation: 90 degrees of swing to the left or right. PowerTilt® is a registered trademark of Helac Corporation.